Around the world there is many sinking cities. Many attribute to unstable grounds and raising sea levels. In Sarawak there is also a sinking town, it is nevertheless the town of Sibu. There are many areas of Sibu town affected badly by land subsidence issues. So what happens back there ? Is the land actually sinking ? What cause the chain of events ? Sibu is a town located at the center of Sarawak. The town is just neighboring the majestic Rajang River. Rajang river is the longest river in Sarawak with length of 1600km that connects the far inland like kapit. It is a town usually bursting with activities during the days, boats and ships cruising along the Rajang river. At the evening sunset, the mile wide river will glow golden. It is a rather peaceful place to stay. The inland of Sarawak is famous for various natural resources including timber, local crafts, plants and animal products. Sibu town forms the major gateway to central Sarawak via Rajang river. Sibu downtown and waterfront located at the confluence of the Rajang and Igan river, with approximately 130km from the South China Sea, it is the largest port and commercial center in the Rajang Basin. It is not unfamiliar to have a sight of discrepancies in height between buildings and roads in Sibu. Certain places will have major fall in road level leaving many exposed building foundations. It is always difficult to get up of the steeps and require extra step of stairs. Often seen are cracked roads and uneven bumps. You won’t have a luxury to have high speed drive around the town without risking scratch beneath the car. At certain places the houses are abandoned due to cracked walls and foundations. Floods are a common visitor in certain parts of the town when there is massive downpour. You won’t find many effective drains around. Most drainage system are actually open drains. Many efforts had been done by the authorities to save the town from destruction. Frequent pavement of roads and repair of facilities are done. In certain places, shop lots and commercial zones are built on top of special raised foundations with visible pillars below. Noted in the Sibu townscapes, there is rarely any high rises. The tallest building is the Wisma Sanyan building scoring 28 floors tall. Second goes to RH hotel for 16 floors and third goes to premier hotel with 14 floors. So what is actually happening in this humble little town that without which it have a potential to becomes a big commercial city ? What is peat ? How peat is related to sinking of Sibu town ? Tropical rainforests in Southeast Asia account for two thirds of the world’s peatlands. Peat is a soggy soils that is mainly contains partially decay vegetation and organic materials. It is nutrient rich and able to store massive amounts of carbon. It is also called the most efficient carbon sink in the planet. Peat forms when plant material doesn’t fully decay in acidic and anaerobic environments. Peat have properties to hold water and responsible for the expansion of wetlands, with usual features of ponds and lakes. Tropical peatland have close relation with swamp. In Tropical Peat swamp forest, the waterlogged soil prevents dead leaves and wood from fully decomposing, forming acidic peat over time. The Tropical Peat Swamp forests are native home to many different animals and plants, deforestation of peatland pushes many species to near extinction. These peat can be used for fuel when dried. Peat is usually the first step in formation of fossil fuels like Lignite coal. Wet or dry peat can be a major fire hazard as peat fires may burn for great length of time underground as smoulders (low temperature, flameless form of combustion, that reignite when condition right). Peat fire is Indonesia peat and forest fire 1997 releasing near 2.57 Gigaton of carbon – nearing 13% to 40% of amount released by global fossil fuel burning. Further fire during 2002-2003 released 200million to 1 billion tons of carbon into the air. Draining of peatland to reclaim for agriculture or other purposes will cause organic carbon trapped in the water initially to be exposed to air and start decompose and turns into carbon dioxide. Peat is easily compressible under minimal weight and hence cause difficulty to build roads and building on peatland. In Sarawak, about 13% of the total land area equivalent to 1.7million hectare is covered with peat soil of varying depths. In Sibu there is near 70% of the land is covered with peat. Most of the Sibu town located on deep peat soil which causing allot of development constraints. The peat soil in Sibu town is very deep at certain areas, causing less feasible for building effective foundation for every structure. The fortification of the foundation requiring extensive piling into the deeper rock layer and thicker fortification filling, hence it is more feasible for buildings. Fortifying road will be less feasible as it may involve in high expenses per meter of road. Overtime the pressure from the structure above will cause the compression of the peat below, causing the “sinking” or subsidence of non fortified structures. It is further worsen by attempt to drain the water out of the peatland as removing water will further reducing the waterlogged peatland and worsening the compression of the peatsoil causing further “sinking”. An alternative is to build artificial lakes and pond around the peatland to keep the moist of the land to prevent accelerated “sinking”. It is indeed a very delicate balance between the environment and the human structure. Understanding the nature and cause of the land subsidence had change direction of newer development projects. Newer development of Sibu town is focus on non peat lands, which is further away than the downtown area. In the near future there might not be a high rise race in Sibu Town, but the battle with the peat might not be an end. 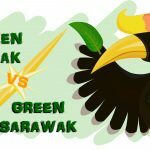 Previous Previous post: Do Sarawakians live on trees ? Floating Solar, will it be the next move in Sarawak ? Things to know before going solar. Read on our detailed guide on concepts, dos and don’ts of solar photovoltaic installations. Join our team in protein folding in the quest of finding cure to some diseases.